Get your business in compliance with the latest, state labor law posting requirements for Illinois. 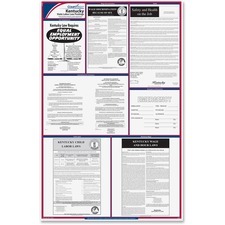 All-in-one, attorney-approved poster covers every mandatory employee-facing notice to streamline state posting compliance. State labor law posters are required by law for every employer. Failure to post the most current version may result in fines. Design features the most recent state posting changes and is developed and monitored by an experienced legal team. Information is consolidated and printed in an easy-to-read format for maximum space efficiency. Poster is fully compliant to ensure strict adherence to size, type font and layout requirements and is laminated for added durability. Update your state and federal posters with this federal/state kit especially designed for Arizona. Both federal and state labor law posters are required by law for every employer. Failure to post the most current version may result in fines. Attorney-approved, two-poster set covers every state-required employee notice plus all mandatory federal postings: Federal Minimum Wage, EEOC, FMLA (updated with 2013 change), Employee Polygraph Protection Act, OSHA and USERRA. Posters feature the most recent federal and state posting changes and is developed and monitored by an experienced legal team. Information is consolidated and printed in an easy-to-read format for maximum space efficiency. Posters are fully compliant to ensure strict adherence to size, type font and layout requirements. They are also laminated for added durability. Get your business in compliance with the latest, state labor law posting requirements for Nebraska. All-in-one, attorney-approved poster covers every mandatory employee-facing notice to streamline state posting compliance. State labor law posters are required by law for every employer. Failure to post the most current version may result in fines. Design features the most recent state posting changes and is developed and monitored by an experienced legal team. Information is consolidated and printed in an easy-to-read format for maximum space efficiency. Poster is fully compliant to ensure strict adherence to size, type font and layout requirements and is laminated for added durability. Update your state and federal posters with this federal/state kit especially designed for Michigan. 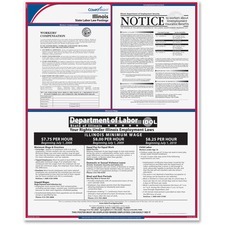 Both federal and state labor law posters are required by law for every employer. Failure to post the most current version may result in fines. Attorney-approved, two-poster set covers every state-required employee notice plus all mandatory federal postings: Federal Minimum Wage, EEOC, FMLA (updated with 2013 change), Employee Polygraph Protection Act, OSHA and USERRA. Posters feature the most recent federal and state posting changes and is developed and monitored by an experienced legal team. Information is consolidated and printed in an easy-to-read format for maximum space efficiency. Posters are fully compliant to ensure strict adherence to size, type font and layout requirements. They are also laminated for added durability. Get your business in compliance with the latest, state labor law posting requirements for Kentucky. 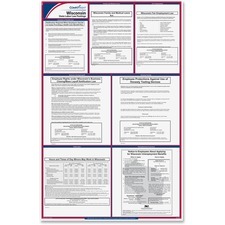 All-in-one, attorney-approved poster covers every mandatory employee-facing notice to streamline state posting compliance. State labor law posters are required by law for every employer. Failure to post the most current version may result in fines. Design features the most recent state posting changes and is developed and monitored by an experienced legal team. Information is consolidated and printed in an easy-to-read format for maximum space efficiency. Poster is fully compliant to ensure strict adherence to size, type font and layout requirements and is laminated for added durability. Get your business in compliance with the latest, state labor law posting requirements for Wisconsin. All-in-one, attorney-approved poster covers every mandatory employee-facing notice to streamline state posting compliance. State labor law posters are required by law for every employer. Failure to post the most current version may result in fines. Design features the most recent state posting changes and is developed and monitored by an experienced legal team. Information is consolidated and printed in an easy-to-read format for maximum space efficiency. Poster is fully compliant to ensure strict adherence to size, type font and layout requirements and is laminated for added durability. 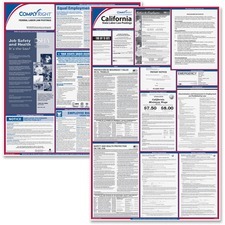 Update your state and federal posters with this federal/state kit especially designed for California. Both federal and state labor law posters are required by law for every employer. Failure to post the most current version may result in fines. Attorney-approved, two-poster set covers every state-required employee notice plus all mandatory federal postings: Federal Minimum Wage, EEOC, FMLA (updated with 2013 change), Employee Polygraph Protection Act, OSHA and USERRA. Posters feature the most recent federal and state posting changes and is developed and monitored by an experienced legal team. Information is consolidated and printed in an easy-to-read format for maximum space efficiency. Posters are fully compliant to ensure strict adherence to size, type font and layout requirements. They are also laminated for added durability. 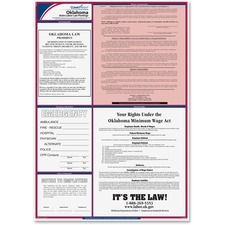 Get your business in compliance with the latest, state labor law posting requirements for Oklahoma. All-in-one, attorney-approved poster covers every mandatory employee-facing notice to streamline state posting compliance. 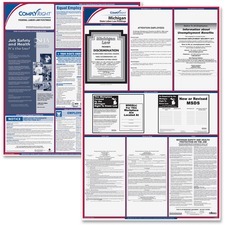 State labor law posters are required by law for every employer. Failure to post the most current version may result in fines. Design features the most recent state posting changes and is developed and monitored by an experienced legal team. Information is consolidated and printed in an easy-to-read format for maximum space efficiency. Poster is fully compliant to ensure strict adherence to size, type font and layout requirements and is laminated for added durability. Get your business in compliance with the latest, state labor law posting requirements for New York. All-in-one, attorney-approved poster covers every mandatory employee-facing notice to streamline state posting compliance. State labor law posters are required by law for every employer. Failure to post the most current version may result in fines. Design features the most recent state posting changes and is developed and monitored by an experienced legal team. 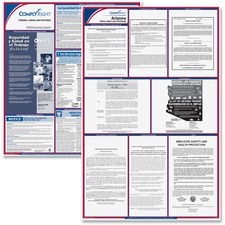 Information is consolidated and printed in an easy-to-read format for maximum space efficiency. Poster is fully compliant to ensure strict adherence to size, type font and layout requirements and is laminated for added durability.